In BEFORE MIDNIGHT, a delightful reinvention of a classic fairy tale, the prince and princess-to-be characters are werewolves. It follows the general rhythm of the Grimm Brothers Cinderella story; however, the characters and setting allow this story to stand on its own merit. And, even though it is an obvious retelling, the story seems fresh. Etienne is a werewolf prince that has been “uncursed” by a well-meaning witch who didn’t understand that he was born a werewolf and therefore his shifting ability isn’t really a curse. In order to remain a wolf shifter, a loupe garou must bite him before the next full moon sets. Loupe is a human female who suffers from the curse of the loupe garou. When she and Etienne meet, Loupe is tending to wolf pups that have lost their mother. Loupe and Etienne are attracted to each other, but each believes they can be nothing more than friends, because of the secrets they are unwilling to share. Their friendship builds trust and fosters love. With Etienne’s time running out and Loupe’s luck running short, an imperious pixie will need to help things along in order for the fated pair to find their HEA. For me, this was a solid story. I love fairy tales and I love werewolves, so this was a good read to sink into. Some parts were funny, some sad, and a few were overly silly. 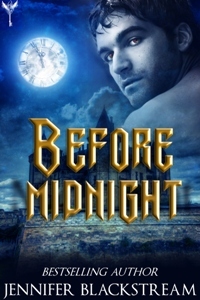 Still, I thoroughly enjoyed BEFORE MIDNIGHT, the first in the Blood Prince series by Jennifer Blackstream. Though not quite in the same vein as Marie Hall’s the Kingdom series, in that it doesn’t quite have a Tim Burton flair, BEFORE MIDNIGHT may appeal to those readers. This book was provided by the author via NetGalley for an honest review. No other compensation was offered or received.